An early “instant book” swept together a potpourri of popular articles greeting the atomic age with both fear and exhilaration and was available on the newsstands by the end of August, 1945. So fierce had American opposition to the Japanese been during the Pacific campaign that few probably saw the irony in such words accompanying an image of “the peace-loving nations of the earth” meditating wiping the “Japs” off the earth. In addition, this notion that the atomic age simultaneously promised utopia or Armageddon was a commonplace of the period right after the war. Shortly after the famed 1946 Bikini Atoll atomic bomb test, Superman was sent to cover a similar event. With a little grit, know-how, and common sense, nuclear war could be survived. 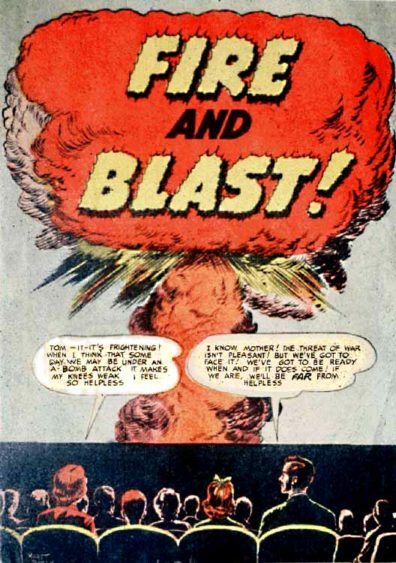 Fire departments distributed this 1952 comic book to help the public deal with the incendiary side effects of the new weapon. Even more effort was put into getting the public to feel comfortable with atomic power. 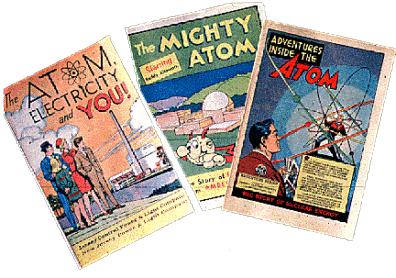 Pro-nuclear comics such as these continued to appear throughout the fifties and later, and were often distributed free to children in public schools. The tendency to trivialize the threat of nuclear weapons is apparent even in this early post-war children’s comic. America’s favorite duck cooks up his own atomic bomb, hoping to get rich. But he is not much of a scientist, and his explosions seem at first ineffective. But it turns out that his mild explosions cause people’s hair to fall out, just like the radioactivity from real atomic bombs, so he gets rich anyway-selling hair-restoring tonic.